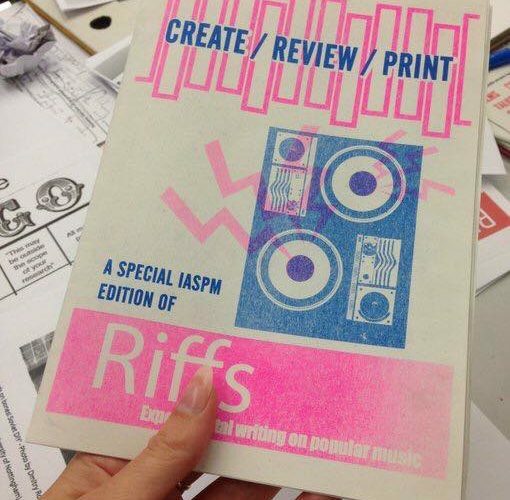 The Riffs team have today returned from an enjoyable 3 days in at the University of Huddersfield for the IASPM UK and Ireland ‘Crosstown Traffic’ conference, where we produced a special ‘zine issue of Riffs:Experimental Writing on Popular Music in just under 48 hours. 250 copies of the ‘zine were printed on site and distributed to delegates. The digital edition is available to read here, or the embed below. Thanks to all our Crosstown Traffic contributors for being part of our continuing zine experiment, the Birmingham City for Media and Cultural Research (BCMCR) at Birmingham City University for their support for Riffs, to Clare and Hilary from the Footprint Workers Cooperative for their sterling work in printing this zine so quickly and efficiently, and to IASPM UK/EIRE for accepting our rather strange proposal. If you would like to talk to us about zines, and in particular how we can help you produce something similar at your conference or event, drop us a line to info@riffsjournal.org. If you attended Crosstown Traffic and somehow missed out on a paper copy, get in touch and we’ll make sure you get one.